How is everyone doing after the long weekend of festivities that was Thanksgiving? We are recovering, slowly. This morning was a rough start to the week, but we made it! 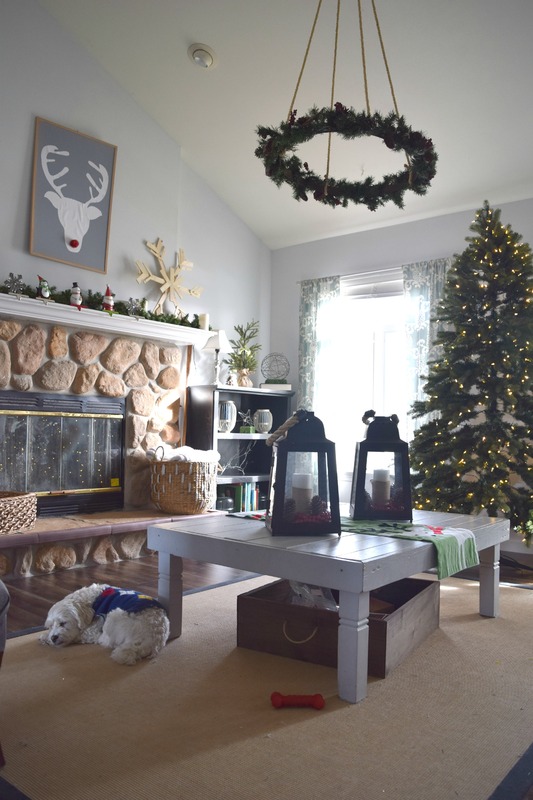 All three kids are in school, on time and I am taking part in the Holiday home tour hop – sharing my living room. 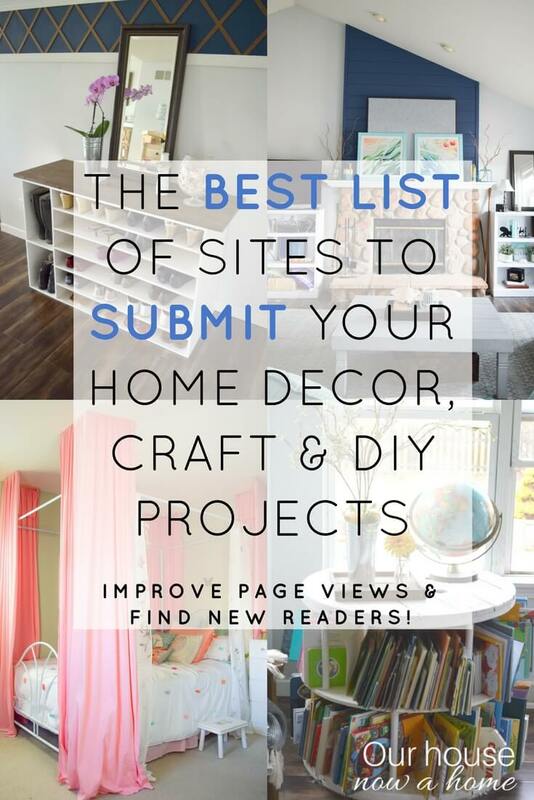 Which means you get to relax, peruse my ideas, maybe get some inspiration, and then you get to hop over to the other lovely blogs taking part in this home tour hop. This is going on for a few days, and each day has a different group of bloggers. I am kicking things off for this wonderful tour. I wish with every tiny piece of my home decor loving heart that I was sharing my whole home tour with you all today. But reality kicked me in the booty last week and I did not manage it all. I have a dining room, study, hallway and outdoors that are almost done. I wanted to add a few last minute craft projects to the mix and I did not make it for this cut off. Have no fear, there will be a follow up to this lovely tour with the entirety of my home. I do have my living room and a bunch of other blogging friends homes to offer you though, which is a massive win! 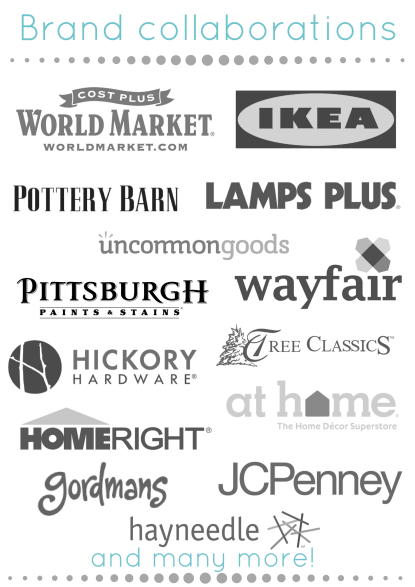 You will be able to find the links to the other ladies home tours at the bottom of this post. So, let’s get this Christmas living room tour under way!!! 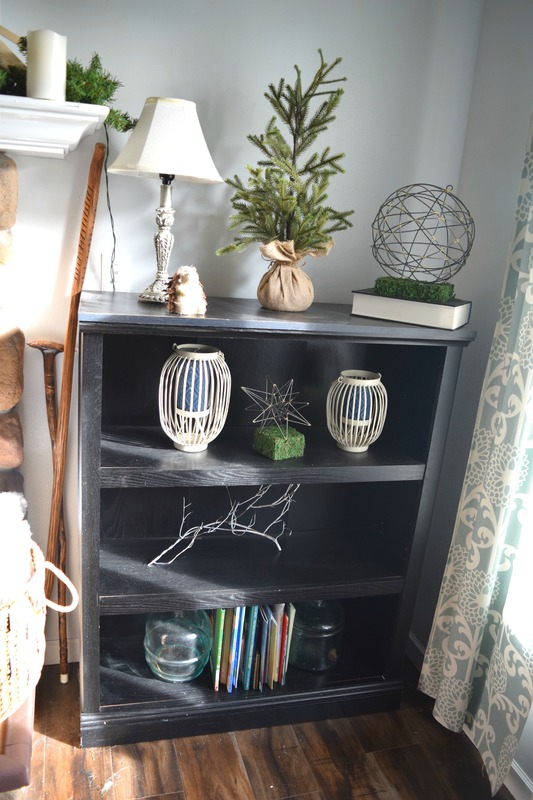 I have worked hard with my home to carve out this little entryway. My home’s front door opens directly into the living room, and I wish I had a big and fancy foyer. 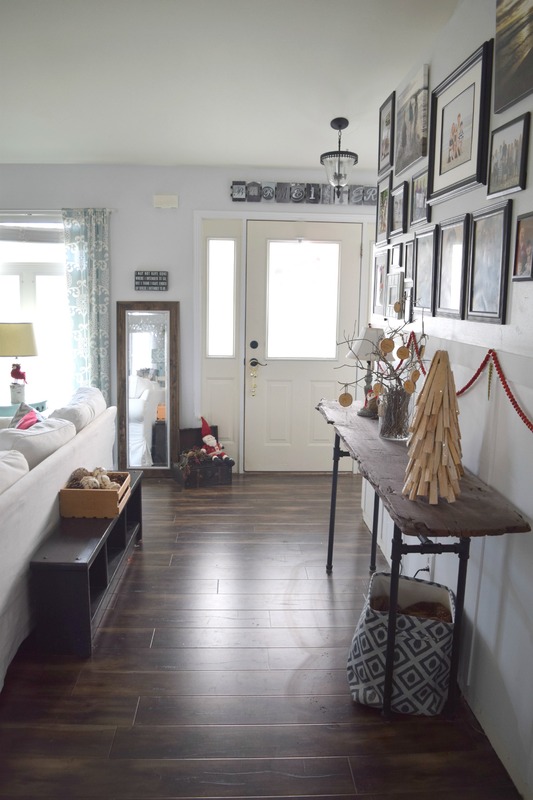 I do not, but some re-configuring of furniture and some well placed wainscoting and console table help this space feel like the welcoming I dream I had for my guests. I keep the holiday home decor to a minimum in this area because it is very high traffic. When people come in with coats, hats, shoes and other things having a bunch of Christmas crafts will just cause a traffic jam in the entryway. The one thing that is most exciting to me with decorating my home for Christmas this year is that I have made it feel light and bright. I always pictured Christmas decor as dark and overpowering. 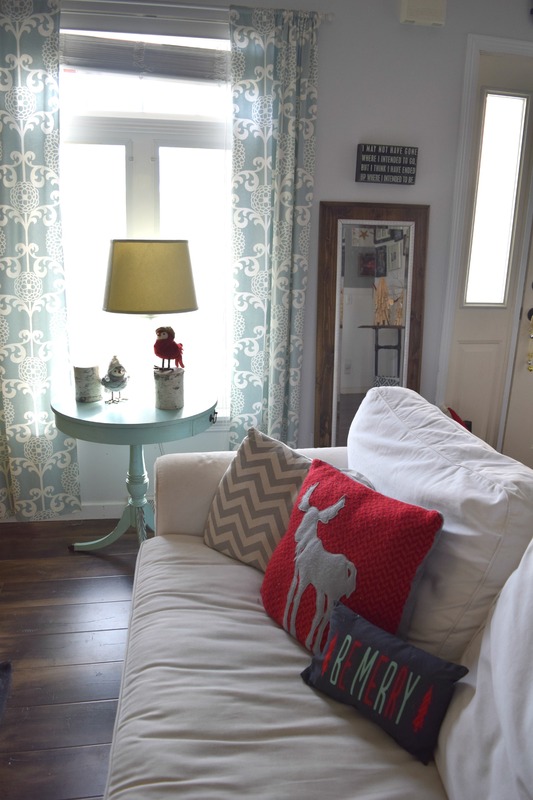 My home is full of bright colors, fun patterns, and not too cluttered. The first few Christmas’s in this home I did the super traditional, partly because I had decorations that Dale and I inherited and also because “we” did not have a home decor style yet. 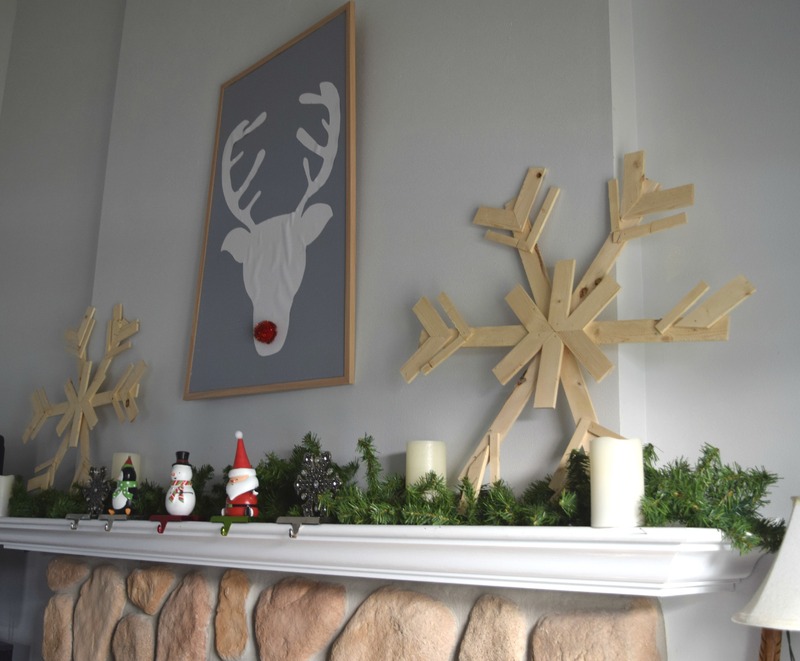 I was able to make a few things like the reindeer wall art and wood snowflakes eventually. It helped me realize I could do bold, loud, fun and bright without it feeling like too much. 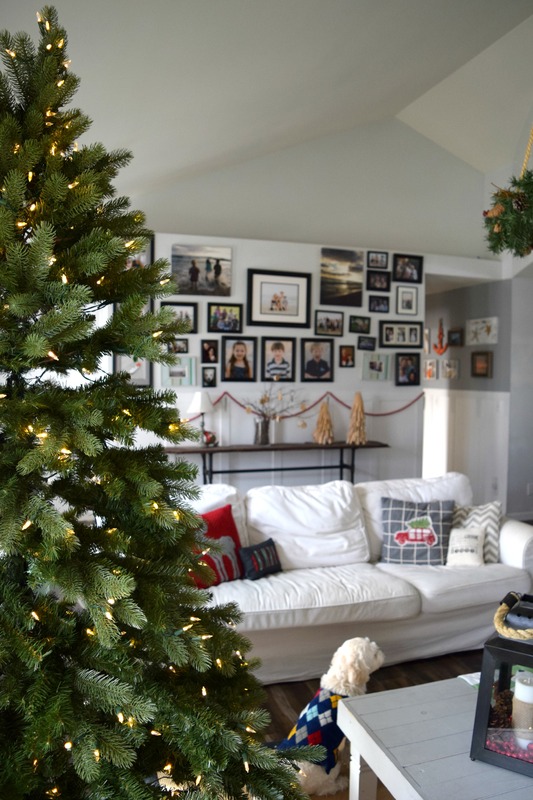 I stumbled into a Christmas home style that meshes with the rest of our home and our family. 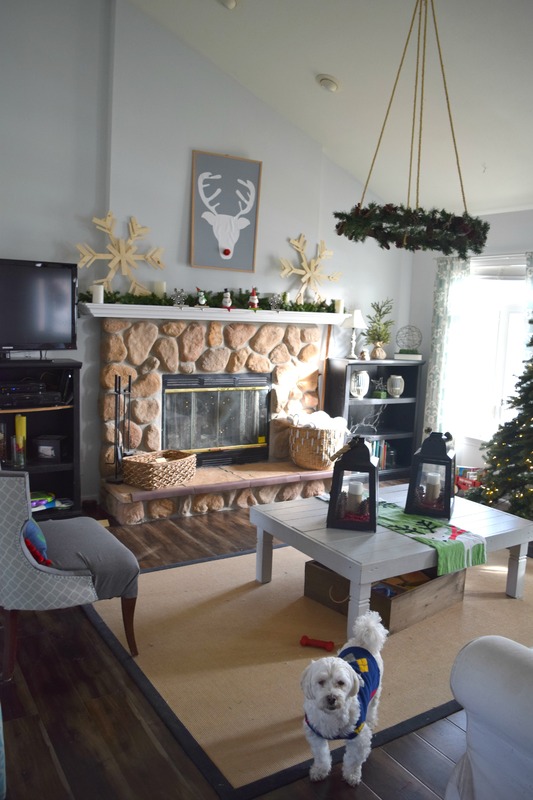 We have young kids, so a little whimsical Christmas feel works perfectly. It took some time, trying things out, making a lot of crafts because money was no a big object. I had to keep it cheap and simple. I transitioned into what works and feels very Christmas-like for us. That is the key to decorating your home all year long. Create the home for you! Let me explain something weird to people about blogging, home decor blogging specifically. My home is the star of this show, I am simply the narrator and creator. What people see and get to know is my home. Which means people see my home, projects and crafts without knowing where they come from. This DIY hanging wreath I made last year is a prime example of this weirdness. It is famous, well as famous as a Christmas wreath can get. It was featured in a bunch of places last year, is my most pinned object. I also had a random experience of a person in the home improvement store with their head in their phone. They were looking for supplies for something. Me, being the nosy person I am leaned over to see what she was looking to make. It was my wreath! Yep, this thing should have it’s own fan club. I can be it’s security. I do adore this wreath and was abnormally excited to get this up. 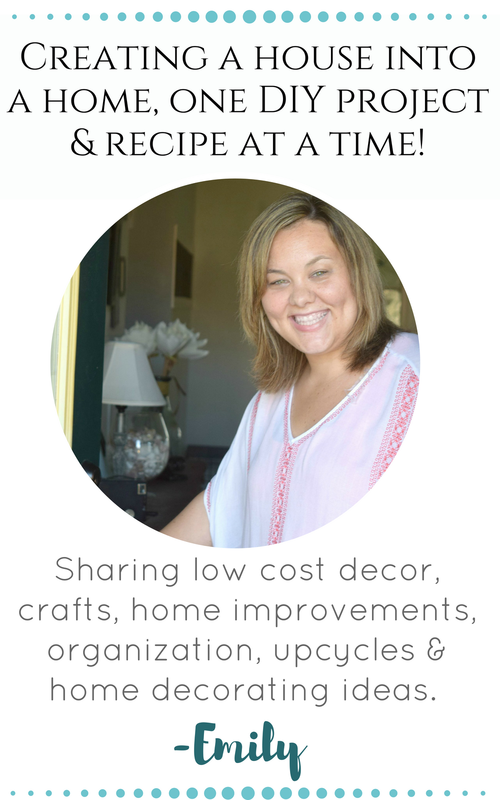 I am trying to be a professional decorator and blogger here, but reality hits me in the face. This is Teddy, who is my shadow and obsessively has to follow me around. He is happiest in my shadow, and this was during his nap time. The show must go on, the bone must be chewed and naps must be taken. Regardless of the Holiday home tour hop going on. These cute little guys will hold up our stockings. It is tradition that we put them up on Christmas eve, and blog or not; I am sticking with tradition. These stay empty until the eve of Christmas. They sure are cute though! I always intended to do more with these snowflakes, stain them or paint them. This year I am positive I am not going to touch them. I love the light wood and simplicity of them. They feel like a breathe of fresh air during the holidays and I am not budging on them now. 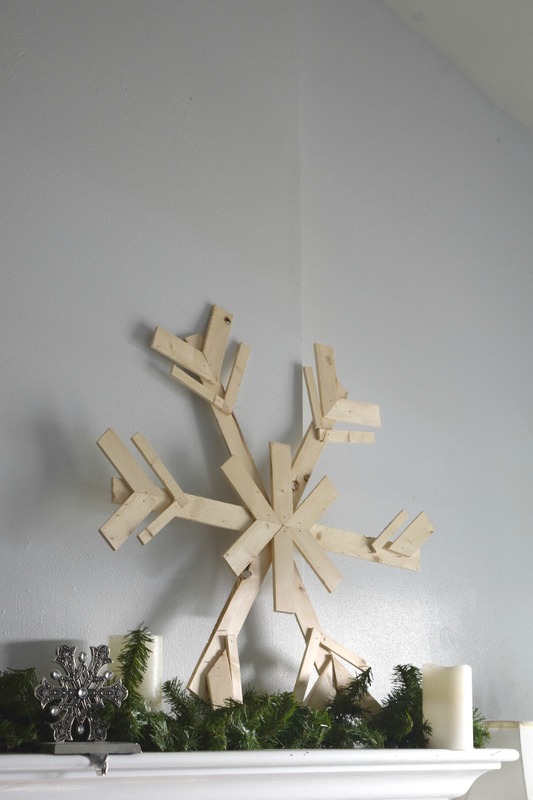 Rustic wood snowflakes forever! This chair with the wonderful joy pillow I reupholstered by not sewing anything! I know, it was crazy and something I will not tackle ever again… until I come across another chair that has too much potential to be ignored. 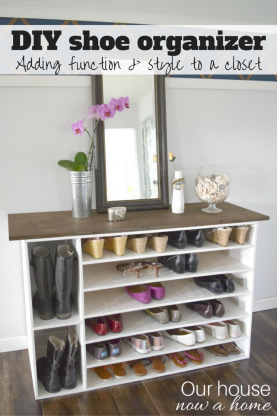 I cannot quit my up cycling obsession! 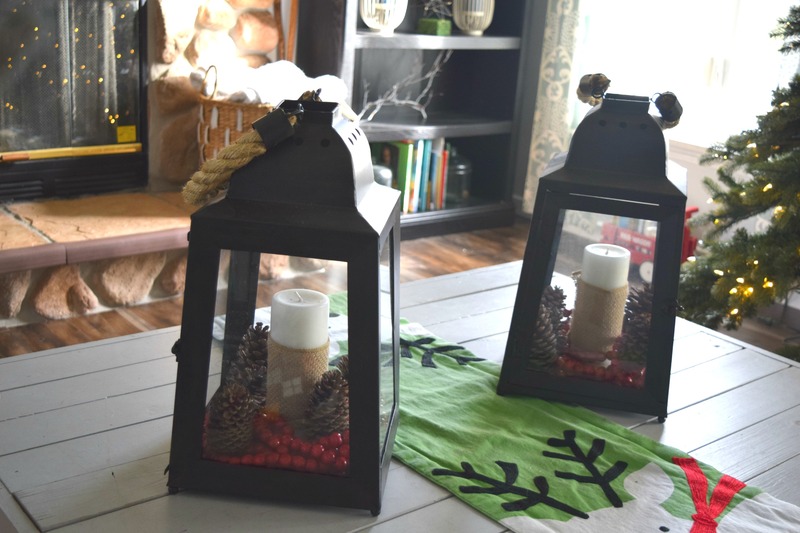 I love these lanterns that I purchased from Gordmans last month. 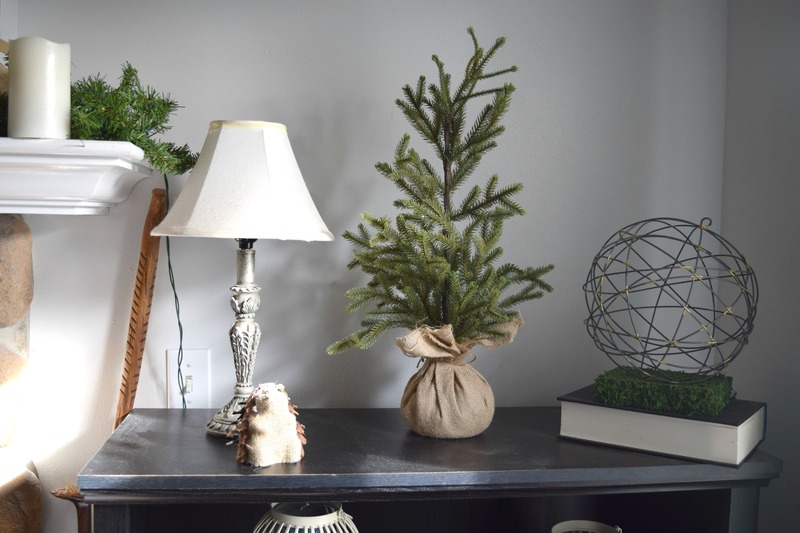 They worked perfectly for my fall decor, and transition into Christmas beautifully. 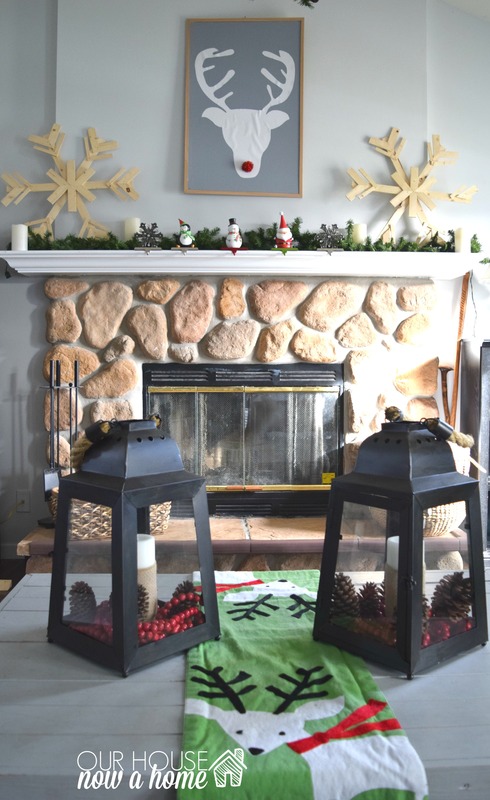 I will be sharing how I made these work for Christmas and also some other simple and easy ways to dress up your home for the holidays. 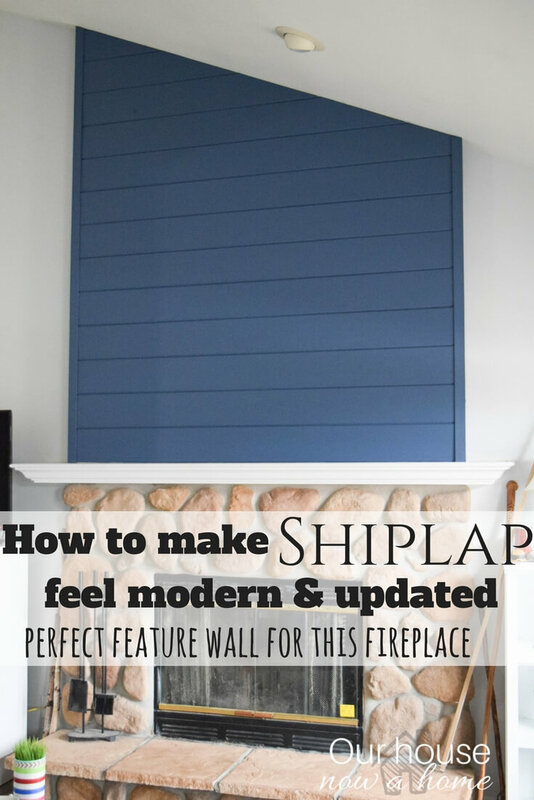 I am all about sharing any ideas I have, maybe you have something similar you can use. Or I get your home decor brain thinking and you have an “aha” moment of your own. Should we play a game of who can spot Teddy? He is almost always there, or was cropped out of the picture. Just my reality. Sparkly wood Christmas tree’s, oh my! I am pretty sure this is the winter wonderland perfectly displayed in home decor. Wood, check… sparkles, check… winter wonderland ready. Photobomb time! Finn needed to get in on the action. Them with their cute sweaters are just too much to handle. We think they are so proper looking they should be called Theodore and Finnigan when dressed in their winter sweaters. Fun fact, Finns sweater is no more because he is still a puppy. His age is zero as my kids call it because he is not One years old yet. Anyone who knows puppies knows that they are on a mission to destroy everything with their mouth, including cozy sweaters. Just the facts. Photobomb #2 Gavin with a retreating Dale. It was the middle of the day. I had 2 of the 5 family members out of the house. Until Gavin starts Kindergarten next year that is about as good as it gets around here. I take the odds and deal with a few eager models for my holiday home tour hop. Can anyone be as cozy as Teddy is on that floor? I need a comfy sofa or bed to be that snoozed out. I know I will get a lot of people asking, these great Christmas pillows were purchased from Target last year. They were a splurge for me, they were not on sale. I had to have them and I have no regrets about that purchase. I am such a rebel and buy things not on clearance…. sometimes….. one time…. at Target. Big spender!!! Teddy is done with me walking around in circles in our living room taking pictures. I know I am. I have a ton of finishing touches to get to for the rest of my home tour, which I hope to share soon! 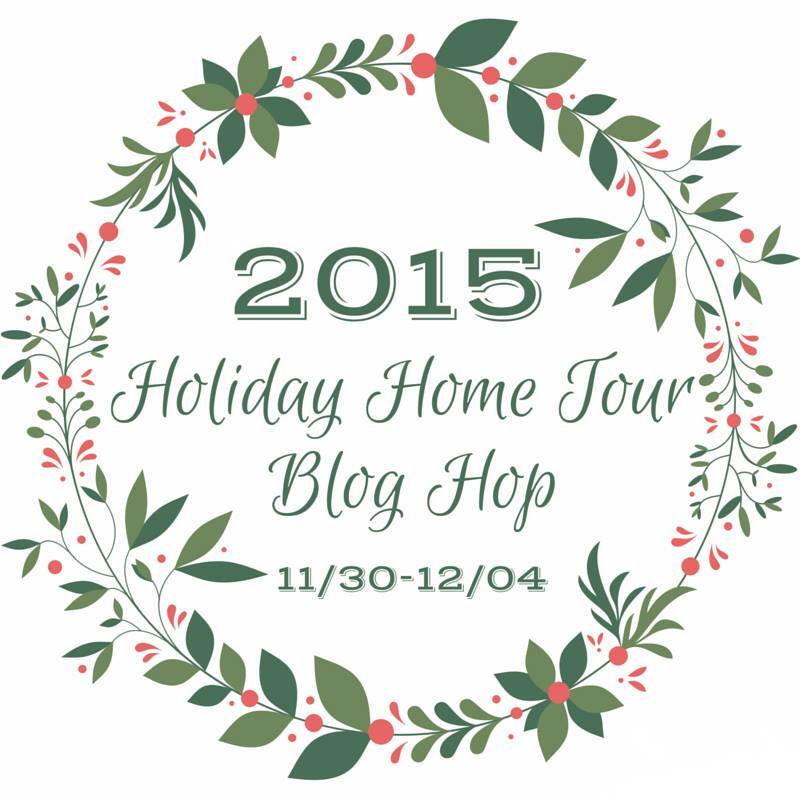 I also have a whole weeks worth of blogging friends sharing their beautiful Holiday home tours. Which kind of screws me over because now I will get even more ideas and want to create more things for my home. I am up for the challenge of looking at their homes and getting inspired, are you?! 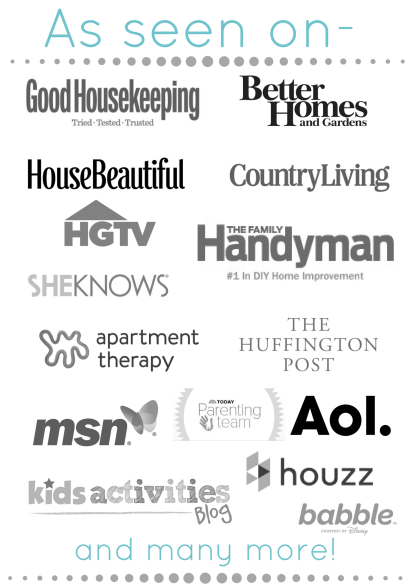 Be sure to check out the other ladies with their home tours. It is a good start to the week after Thanksgiving, we all need a slower going Monday after the beast that was this past weekend. 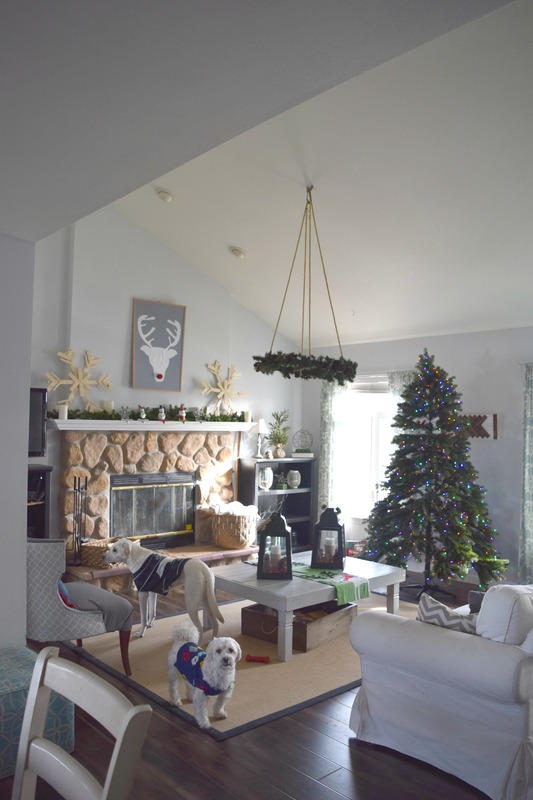 How do you usually decorate for Christmas? Are you more traditional, simple or fun? 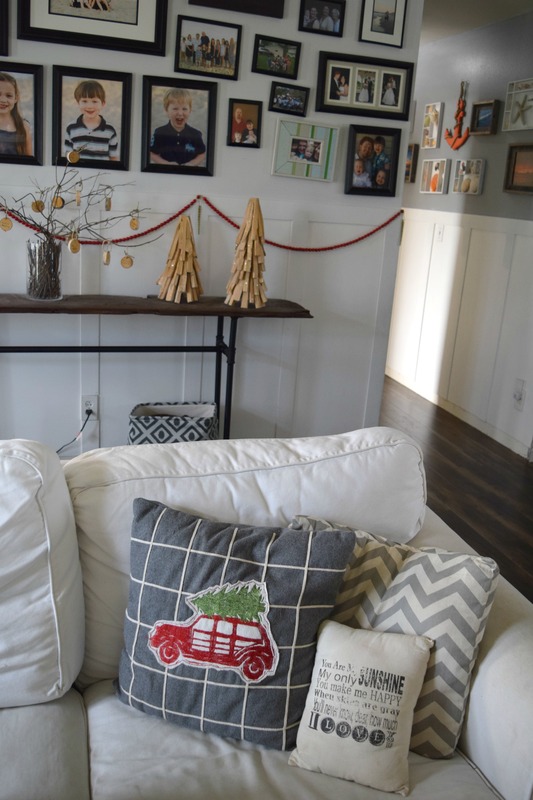 There are so many great ways to decorate for the Holidays! 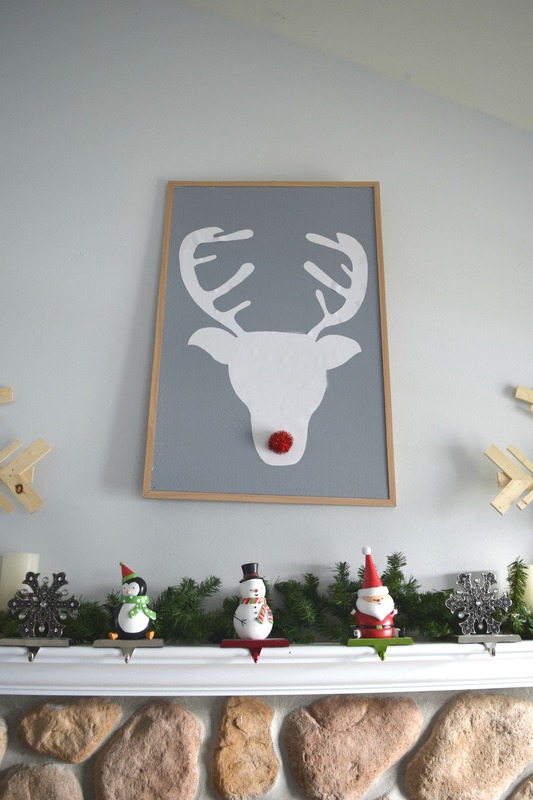 Love the hanging wreath and the Rudolph print. I love how simple and neutral, but still beautiful it looks. Great job! My kids take over the Christmas tree decorating. I let them go crazy with it so never get much say in it. Have fun decorating! Oh my goodness I looooove your hanging wreath!! I’m definitely going to make that this year! Thank you! Have fun making one of your own, it is my favorite holiday project I have made yet. Thank you so much! I just redid the gallery wall and was worried it was a little too cluttered. Your Christmas decorations are beautiful. I love your fireplace and the art above it! Thank you so much! This is our home and the kids and dogs are the reality of it. Thank you so much for saying that, you are so sweet Michelle! Simply gorgeous Emily! Love every bit! Emily I love your home. It is beautiful and most of all real for a real family with real kids. That hanging wreath is gorgeous. I may end up stealing the idea. You sure have been very busy lately with the kids bedroom and now the tour. Hope you have a great holiday season. Thank you! I have always tried to make the home work for both kids and adults. 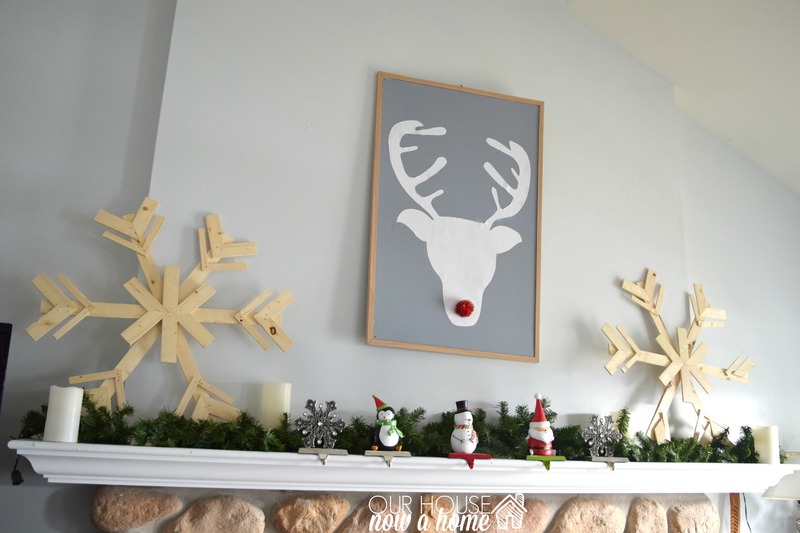 And steal away on the wreath idea, that is what this blog is all about! Wow!! Everything looks so beautiful!!!!! Merry Christmas! I love all of the rustic and earthy elements you incorporated into your decor. And your chandelier with garland is stunning! Definitely pinning this. Amazing job!!! Lovely tour of your home all decorated for Christmas, Emily. The dogs are just too cute. 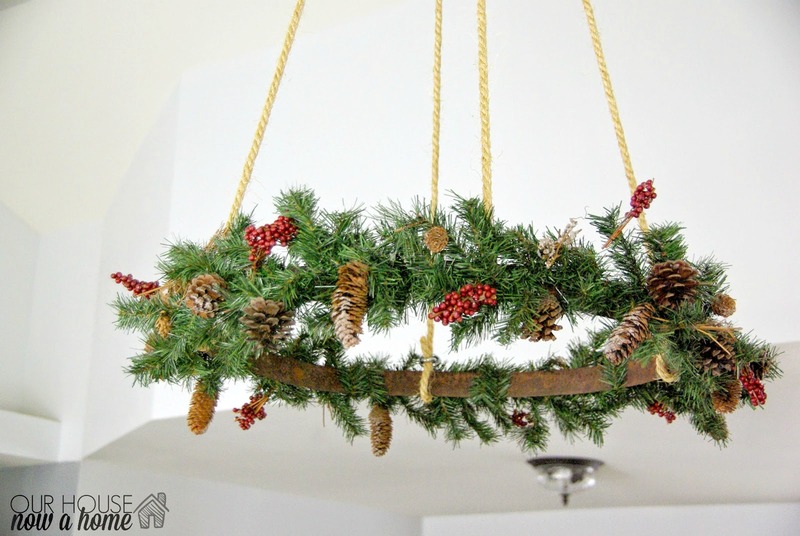 That hanging wreath is such a neat idea! Thank you, the dogs know that they are cute and are always ready for the camera. Those bare snowflakes are fabulous! I like them just the way they are. And kudos to you for keeping reality in your home tour. It’s like an nice window into “a day in the life…”. Love the dogs! I had to put my 2 big babies outside while I took pictures. They had all sad faces looking through the window, which broke my heart, but they probably would have kicked over the camera. Ha ha, this is a day in the life, all day. Thank you so much for the sweet words. I try to banish my kids and dogs but it only works for so long. This is my home and my real life, kids and dogs photobomb it. SO gorgeous, Emily! 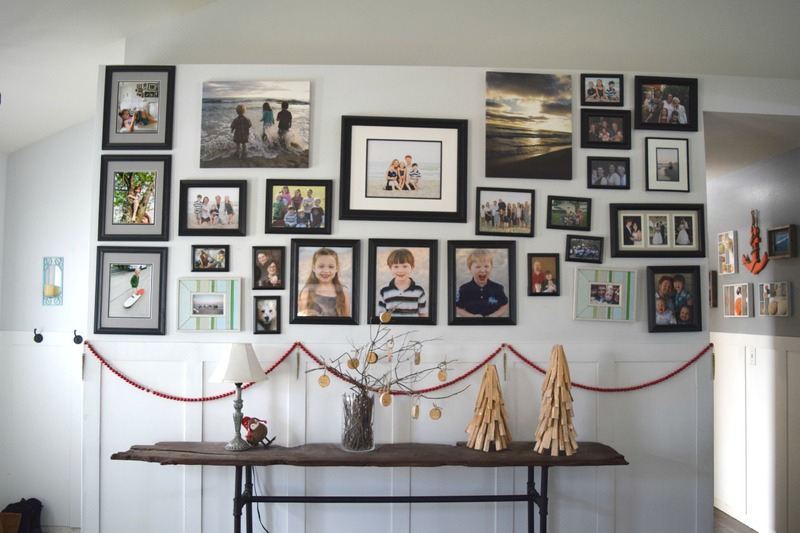 I especially love that hanging wreath and your beautiful gallery wall. Great job! 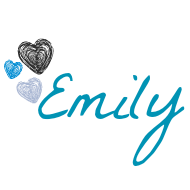 Loves great Emily! That hanging wreath is ahhhhhmazing!!!!! 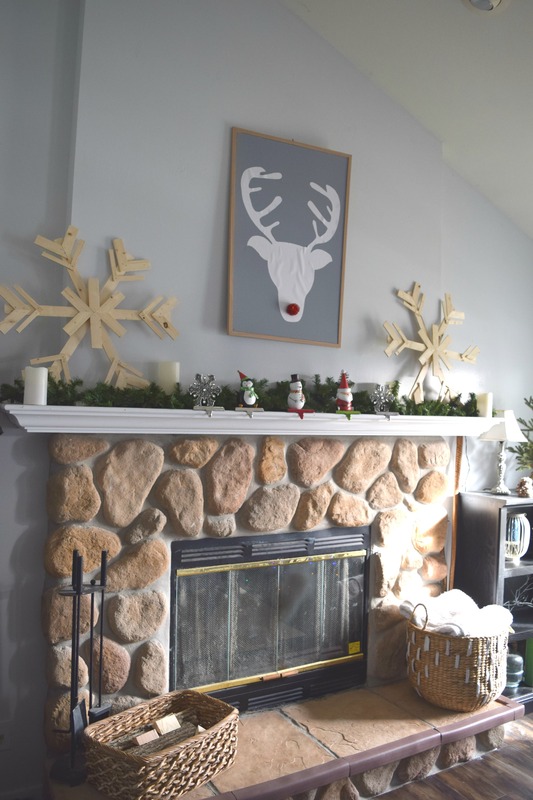 Rudolph on above the fireplace rocks too! Love the tradition of the stockings coming out Christmas Eve too! Thank you! 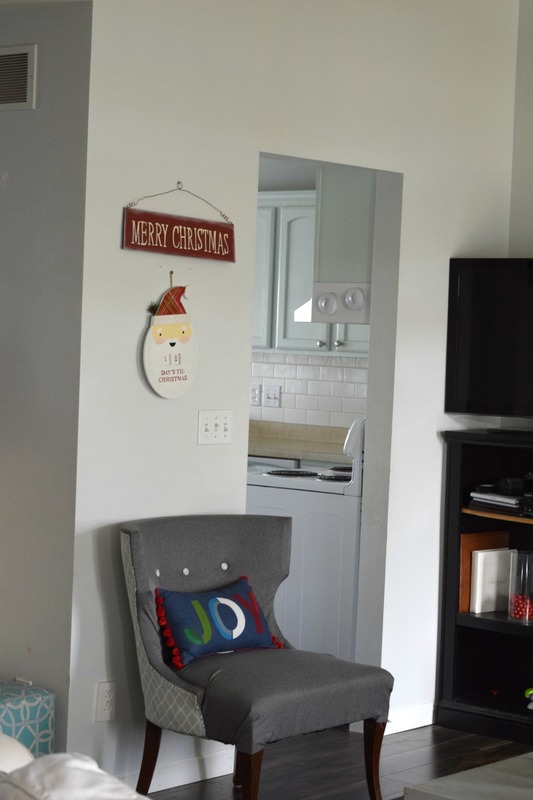 The hanging wreath is a standout project for me too and I love putting it up. It makes the room feel like Christmas. Ok, I want it all! 🙂 So beautiful. Especially want the pillows: car and reindeer. So so cute! So pretty!! I love the lanterns and the pretty hanging wreath, I’ll join its fan club 🙂 And I love all the throw pillows! 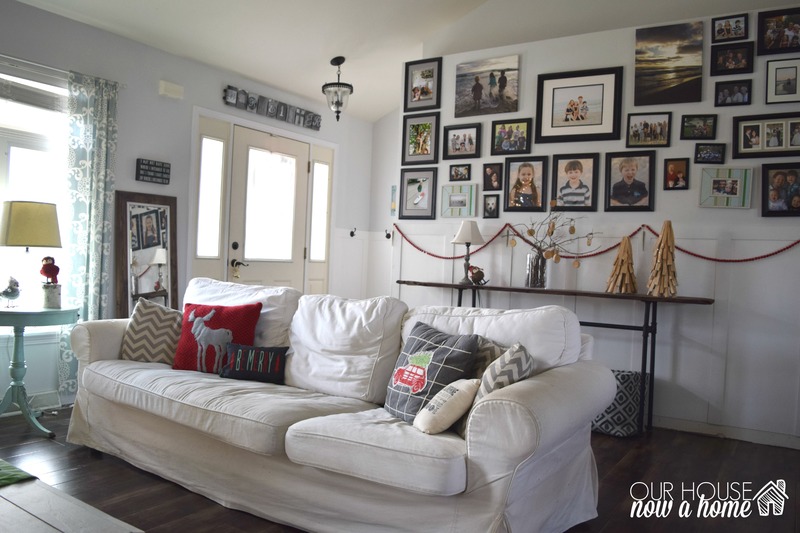 Your house is super cute and kid friendly. Thank you! 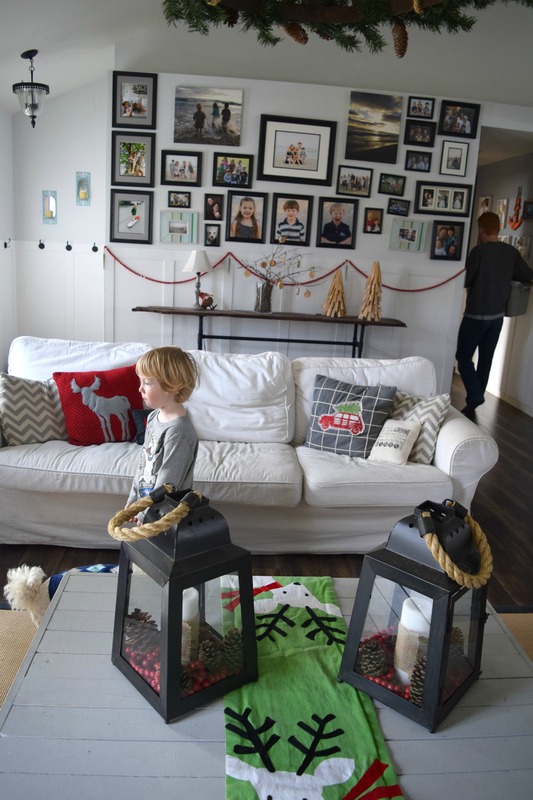 I try and make my home comfortable for adults and kids. Emily, your living room looks wonderful! 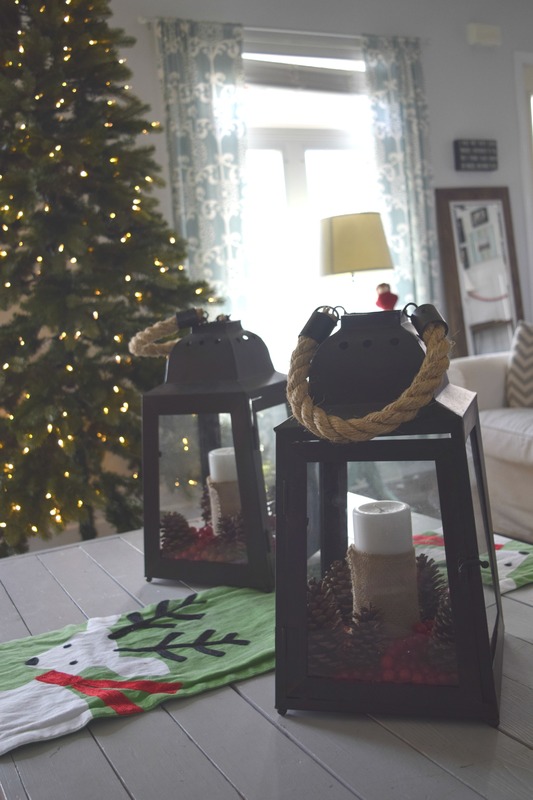 So festive but still in keeping with your light, relaxed home style. 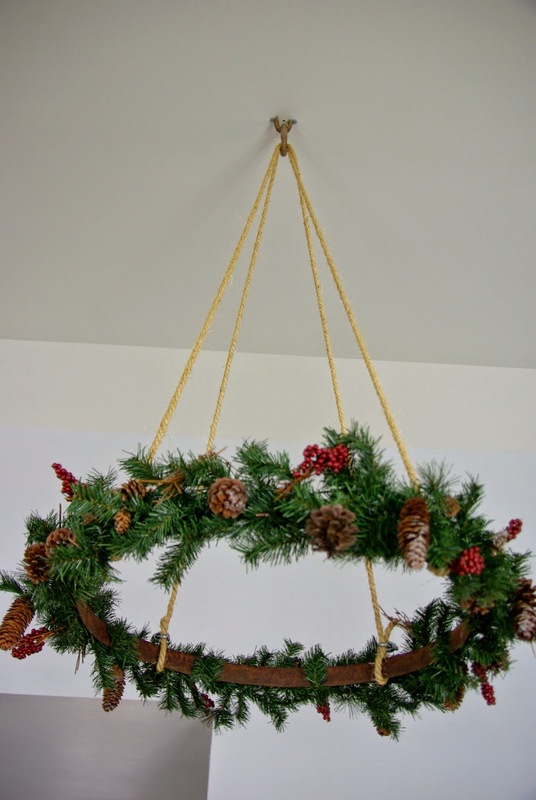 The hanging wreath is pretty awesome–no wonder it’s so popular! Thank you! 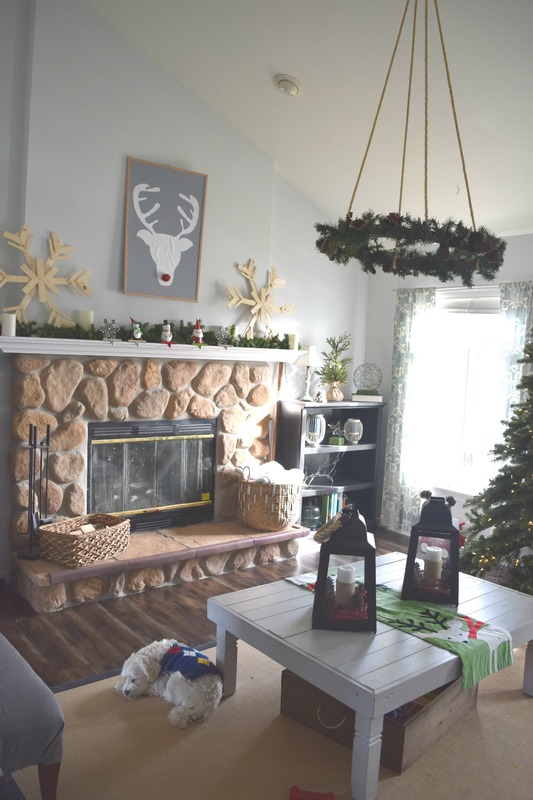 I have had fun making holiday decor work with the natural style of my home, and got it pretty close this year. Love your home! Those throw-pillows are so cute! I love the neutral colors yous used with pops of red. 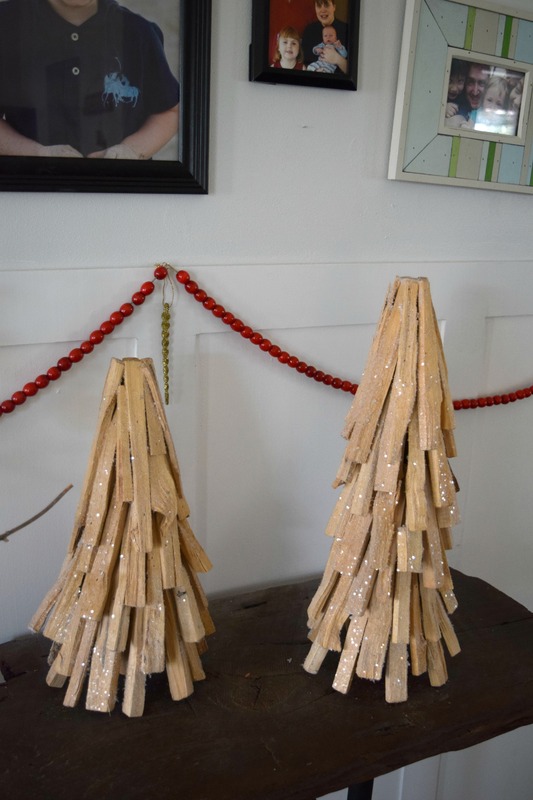 Those wood Christmas trees are my favorite!! Beautiful holiday decor. Oh my! Those huge lanterns are awesome. I love how you have used them to transition into Christmas. Love the hanging wreath too! I’ve always wanted to make one for my dining room. Thank you so much! I am in love with those lanterns and will over use them I am sure! Everyhing turned out so pretty Emily! 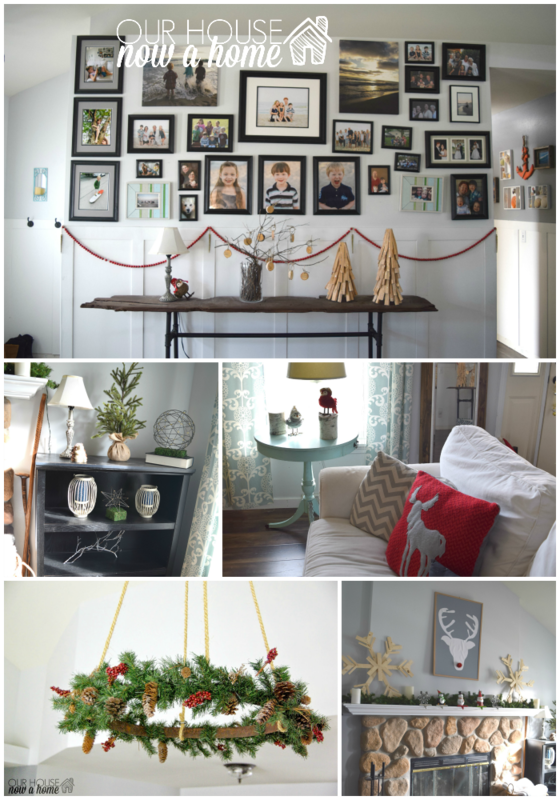 I especially love the garland draped on the wainscoting! And of course the addition of your pups! Loved the tour! Your house is fabulous and I loved seeing all you have done this year for the holidays!